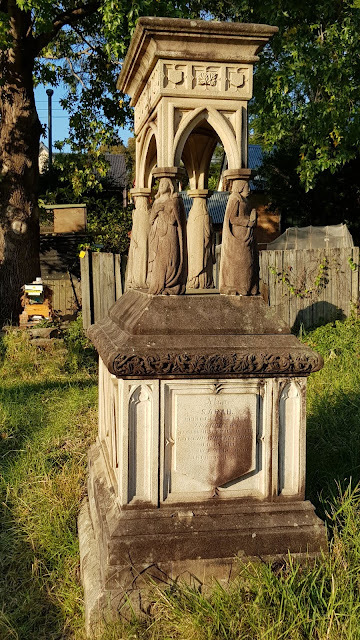 Camperdown Cemetery is an historic cemetery located along Church Street in the inner-city suburb of Newtown. The cemetery was founded in 1848 and was for twenty years the main general cemetery for Sydney, with the total number of burials being about 18,000. St Stephen's Anglican Church is located within the present bounds of the cemetery. John Roote Andrews was a monumental mason who carved most of the monuments and headstones in this cemetery. He provided his family with this memorial in the Scottish style, with a canopy supported on four small caryatids and decorated with the thistle and vast majority of them are from Sydney sandstone and are the product of the flag of St Andrew. Quite an impressive design on this one. ...I've seen several around here of this style, but none with the quite the detail as this...beautiful. That mason must have been a very busy man, with job security. In the past they did beautiful monuments or sculptures on graves. Today it's completely different ! It's really huge !